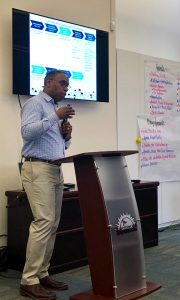 On April 10, 2019 JobTrain hosted a Community Convening on the East Palo Alto Career Center to hear about what activities are happening at the Career Center, who is being served, and gather input from community members on their awareness of services provided, and feedback on additional programs and services that could be offered at the Career Center. The facilitator of the convening was the Peninsula Conflict Resolution Center (PCRC), a nonprofit organization that has an excellent reputation as a community facilitator. At the convening PCRD provided simultaneous language translation services, enabling the meeting to include a much of the community as possible. Funding for the convening was provided by a grant from the Chan-Zuckerberg Initiative. There were three goals of the convening: 1) to respond with the actions taken as a result of the community’s comments and suggestions made during the May 23, 2017 community meeting prior to the Career Center’s opening; 2) to inform the community of the Career Center’s progress and to present the data results for the February 2018 – February 2019 time period; and; 3) gain feedback on operational procedures, such as hours and days of operations, fixed versus mobile service offerings, and all other programs and services that might be provided. More information about the East Palo Alto Career Center can be found HERE.